Nearly everyone has experienced sticker shock. Open up the cable bill and find a higher rate than last month. Pull up to the gas pump and see that the cost per gallon has risen overnight. No matter where they appear, price hikes are never welcome. Today, higher-priced manufactured goods—from cosmetics and pharmaceuticals to agricultural products—are a particularly unwanted trend. As the 2019 season gets underway, growers and resellers who are feeling the sting of more costly crop inputs are looking to product manufacturers like Syngenta for support. To find solutions to problems, it’s often helpful to understand what’s causing them. Austin Parrish, head of business planning at Syngenta, says the factors driving up crop input prices fall into three broad categories: fewer raw materials, higher transportation costs and less-certain trade dynamics. According to Parrish, the primary driver of raw material shortages is the increase in environmental controls governments are placing on foreign manufacturers. In regions of the world where these raw materials originate, many production facilities are shutting down to make improvements required for more stringent regulatory monitoring and protocols. As regulations and economic forces drive price increases in the crop input market, @SyngentaUS is positioned to lessen the impact on growers. Unfortunately, this effort to improve the environment is reducing overall product availability, which drives up costs not only in agricultural markets but in consumer markets as well. Couple those challenges with changes in the transportation industry—domestically and abroad—and the problem is compounded. As with environmental regulations, the transit issues are a direct effect of an otherwise positive trend. In addition, the Electronic Logging Device (ELD) mandate requires truckers to use ELDs to monitor the number of hours they are behind the wheel—even when they are waiting in line to load and unload their cargo. As a result, transit times are growing longer for drivers who are forced to keep a tighter rein on their hours. Meanwhile those trade issues are also hitting growers directly, when it comes to the prices they’re receiving for their commodities. Those increasing pressures make it more important than ever for growers to find a partner who is not only working to mitigate price increases but can also offer value outside of just the sticker price. 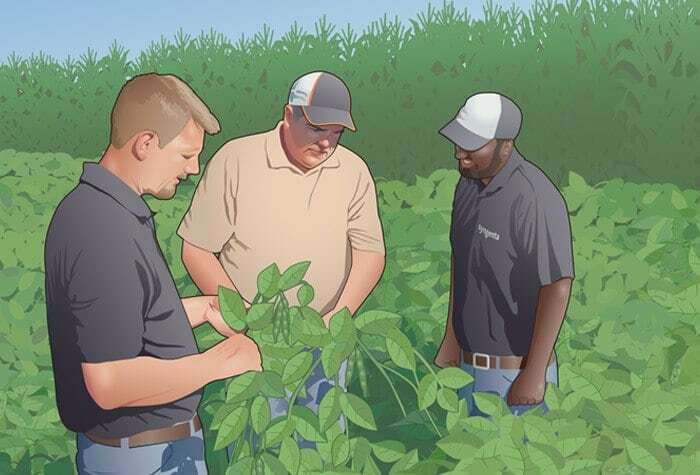 Parrish and others at Syngenta who began working to proactively lessen the burden of the costs to customers in 2018 understand that each challenge requires its own set of solutions. Syngenta has comprehensive plans in place to improve operational efficiency heading into 2019. Given its global footprint, the agribusiness is in a good place to continue managing its manufacturing costs by using long-term, strategic relationships with a number of raw-material suppliers. Additionally, Syngenta maintains partnerships with more than 20 trucking companies and 17 bulk shipping terminals to help ensure timely deliveries. Those efficiencies don’t go unnoticed by customers, either. Agronomy Department Manager Brent Deppe at Key Cooperative in Grinnell, Iowa, works with his Syngenta rep, Alex Ogren, year-round and counts on the company’s reliable logistics. While teams at Syngenta are working to absorb cost increases as much as possible, the company hasn’t slowed its industry-leading pace to develop innovative new tools for the farm. For example, its goal of bringing four new active ingredients and 15 new brands to the market by 2020 is still firmly in place. To maintain a powerful portfolio, Syngenta invests $1.3 billion into research and development each year. Much of that goes toward the development of new crop protection products, which can cost up to $286 million per product and take more than 10 years to develop. Additionally, Syngenta couples its innovative product portfolio with more than 250 experts in sales and agronomy at the farm level across the country.